Many thanks. Method 2 works fine, so I’ve recovered the links of my gadgets with more than 15 bookmarks. The smaller ones reap eared today, though with some functionalities disabled. I hope Joshua manages to redo his great Enhanced Bookmark Gadget, which I’ve enjoyed using for 8 months or so. I had been very lost without my bookmarks, thanks for your help. Neither method works (using IE8 w/XP). Any other suggestions? 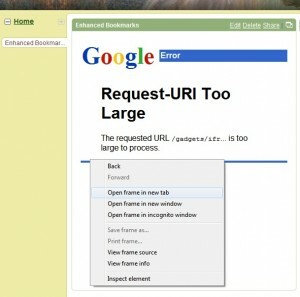 Tried method 1 but it didn’t work – still got the same “URL too big” error message. A few of the values (off the top of my head I can’t remember which) simply weren’t there to replace, so maybe the method didn’t shorten the URL enough? But method 2 worked a treat! Oh man… I am SO relived that there was a recovery procedure (and a simple one at that!). I was devastated when my bookmarks disappeared. I hope that the next build come soon, and that Google doesn’t pull the rug out from under you (and us!) again. Keep up the good work! Method 2 Worked brilliantly. Thanks! Thanks so much for taking the time to explain method 2 – inspired – and worked perfectly. Thanks Wolfgang! Option 2 worked great for me. Very elegant solution. Method two worked for me. I’m on a MacBook Pro. http://www.google.com/ig is usable for me, although not perfect. My usual homepage http://www.google.co.uk/ig?hl=en&source=iglk doesn’t work at all. I deleted the Enhanced Bookmak gadget before finding this site. Now what do I do? First method didn’t work because the ‘long’ url was hidden, second method worked a treat. Many thanks I was begining to wonder if I would ever see them again. Why did I not back them up? Method #1 worked well with FF 3 – fired up notepad++ and cleaned up the characters, then pasted into Json which I use all the time for Fiddler as well… Thanks so much. Method #2 worked perfectly. Simply amazing. THANK YOU!! Method #2 in Firefox works like a magic trick. Thank you SO MUCH!!!! Wolfgang’s suggestion worked great and was very easy. Thanks and looking forward to the bookmark gadget’s return. Google clearly doesn’t want users bookmarking things – they want us searching for things!!!! I used the first method and it worked for me. I had read the warnings about not editing your bookmarks in whatever way you could find, so all was there still. I copied the long piece of data not to Json viewer, but to Editplus. I had 6 sections of bookmarks in the enhanced bookmark gadget, all of them had more than 20 links and most of them are related to my PhD research. Unfortunately, we, users, have a tendency to take all these new gadgets for granted, until they break up. Then we start complaining…we kind of forget what is Free and Open source about. Woo Hoo, thank you so much! I needed all those for uni, you are a god, cheers! Method 2 worked. My husband is eternally grateful. Thanks! Worked perfectly !! Thank you so much !!!! Method 2 worked GREAT.. I am so relieved… that’s what I get for not backing up before, though. Thank you! I really miss this gadget. Actually, I still can use it. By clicking “open in new tab” my bookmarks are still available and it’s not such a big deal to not be able to open in the same tab…. Method 2 worked for me 2. TNX a lot ! bad thing it crashed though. It changes a bit the interface of igoogle and uses a different version of gmail, but it does the work perfectly. You have to opne the bookmarks on a new window with the far right button, otherwise the link will open inside the bookmark module. Luckily today the gadget start working again. I deleted on part of about 12 parts with bookmarks so just lost a few. 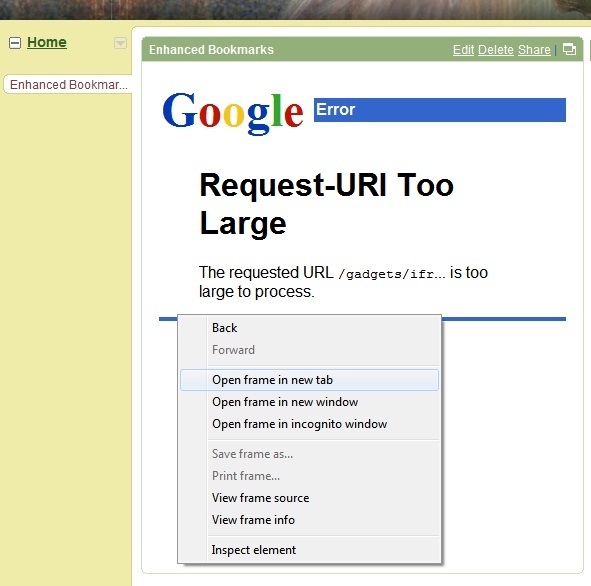 Google made very clear that they do not allow gadgets which are programmed in a way like “enhanced bookmarks” was done. So even it might work today, you may loose them tomorrow. In any way, you should make a backup with one of the two ways described here. Los marcadores han reaparecido automáticamente y funcionan bien. I tried method 1 and it worked but unfortunately didn’t last, Anybody can tell me where or what went wrong? would really appreciate gettin my bookmarks back and while we are on the subject of patches and things like that there, would really like my calendar back as well. google is screwing up big time. tried the chrome browser, hate it for the most part so not goiging there again either. I can only 11 bookmarks add to my igoogle:((( I like it and i have more than 11 bookmarks…. What shalll I do?